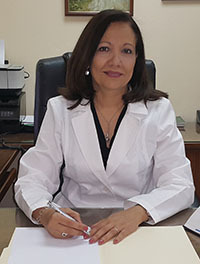 Rosa Buitrago is a clinical pharmacist and currently Professor of Pharmacology and Cancer Pain Management at the School of Pharmacy, University of Panama. She was elected Vice Dean of the School of Pharmacy for the period 2011-2016. Her work on teaching pain management and palliative care at the School of Pharmacy, which began with an undergraduate course in 2004, led to graduate courses and recently to the approval of a Master’s Degree in Oncology and Palliative Care. Professor Buitrago has extensive experience and expertise in the areas of policy-making to improve access to opioids and pain management; proposals to solve problems related to the use of medicines in different Latin American countries, based on pharmaceutical knowledge of the area; critical evaluations and proposal of laws, decrees and resolutions of the pharmaceutical sector in Latin America, and curriculum planning in pharmacology, pharmacotherapy of pain, palliative care and quality of medicine. She has trained several hundreds of healthcare providers in the field of pharmacology and pharmacotherapy of pain management and palliative care. She has also been very active in improving opioid access and availability, not only in Panama but also in Peru, Jamaica, Nicaragua, Ecuador, Bolivia and Guatemala. She was a member of the group that prepared with the Venezuelan Association of Palliative Care and the IAHPC the Latin American Opioids Manual (2009). At national level, she has played a key role in promoting changes to the regulations for prescribing and dispensing opioids in Panama. She works closely with the National Palliative Care Program of the Ministry of Health in Panama to improve opioid availability through education. Prof. Buitrago was invited by different non-governmental organizations to attend the 53rd session of the Commission on Narcotic Drugs in order to support the resolution, proposed by the United States, to promote the concept of balance between measures of access and control for the next ten years. She has been very active as a peer reviewer for the World Health Organization (WHO) on the topics of ‘Pain’ and ‘Opioid access and availability’ and is a member of the WHO Expert Committee on Drug Dependence. In 2010, Prof. Buitrago led a research team that received the ‘best poster’ award in the category of ‘Impact of research results in health care systems’ at the Ibero-American Congress of Schools of Pharmacy. Prof. Buitrago joined the IAHPC Board of Directors in 2014 and is currently collaborating with Mary Callaway and other directors in the IAHPC's Certification Project. She is particularly interested in activities to improve opioid access and availability. Her work on developing regulations to improve opioid access and availability in Panama was recognized in the 2010 International Narcotics Control Board report. This was the result of teamwork supported by IAHPC and the Pain & Policy Studies Group, University of Wisconsin, Madison, where Prof. Buitrago was awarded a fellowship in 2006-2008.